“I want to go to the Eiffel Tower! I want to visit the Louvre!” my kids chanted as my husband offered up every tourist attraction for our upcoming trip to Paris. I, however, cringed at visions of long queues and sharing these experiences with people from every country but France. 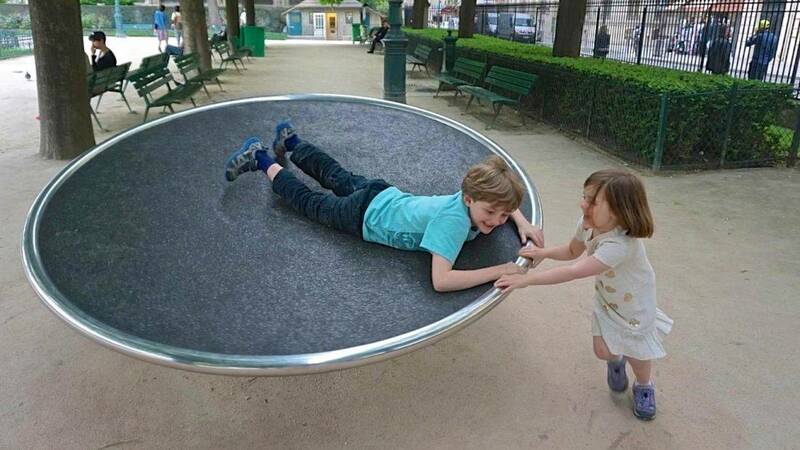 When I suggested a few Paris playgrounds, a look of sheer horror crossed my husband’s face. “We can do a playground here at home…why?” It’s not just the difference in equipment that my kids would notice, although I must say that French playgrounds seem to have lower safety standards. It provides a glimpse into everyday French life at a level my children can understand. Playing, running, and climbing alongside them, my two would come to realize that playground time is something that their French counterparts also enjoy. And this is one of many similarities and differences that I had hoped my children would subconsciously soak up on a trip that I wish could have been longer. And then I got unbelievable news. Air traffic controllers were going on strike, and we had to move our trip ahead by two days. A French strike was actually going to work in my favor for a change. Who cares why they are striking? Living in Paris my junior year, I cursed the postal service strikes that would hold my letters from home hostage in the pre-internet age. Twenty years later, the strikes felt like a surprise gift. I was thrilled that we were getting to Paris early, allowing me more time to immerse my family in everyday French living while still promising the Mona Lisa at the end. I even read French Kids Eat Everything on the plane ride over under the illusion that I could change my children’s diet in four days in what took the author a year to accomplish. We rented a reasonably-priced apartment (Search for vacation rentals in Paris.
) on the sixth floor of a walkup building with a stunning view of the Notre Dame gargoyles. Lugging baggage up those spiraling stairs and carrying weary children up at the end of the day gave us a peek into Parisian apartment living. We felt a renewed appreciation for our double-car attached garage in the suburbs. But we fell in love with this little birdhouse in the sky with its tiny, turquoise blue door that my husband had to duck under each time he entered. The next two days we sat in cafés, shopped in supermarchés, visited open-air markets to brighten our apartment with fresh flowers. We bought our daily baguette at the boulangerie, sampled new cheeses at the local fromagerie, and frolicked in playgrounds where my son learned his first French phrase of “plus vite, plus vite!” We had brunch with a Parisian acquaintance and tested my kids with a drawn-out French meal. They enjoyed le goûter, the French equivalent of a child’s pre-dinner snack, and our children ordered their tartines et chocolat with a s’il vous plaît and merci. We took the Métro or covered Paris by foot, walking over 30 miles in those few days. Except for the sore feet, Parisian life— through the eyes of my kids— was mostly bliss. I was grateful that I had read French Kids Eat Everything. More than a how-to on families eating better, the author delves into what makes French mothers tick. The French are a closed society with little room for newcomers, much less expats. French women choose quality over quantity when it comes to friendships, one commonality that I relate to and respect. So the American concept of “mom friends”, helicopter parenting, meals on-the-go, and posting life’s every moment on Facebook is incredulous to them. It’s helpful to keep this in mind when as an American, you might get the cool shoulder at French playgrounds. I, fortunately, had the luck to strike up a conversation with a Parisian father instead. He was delightful and full of suggestions on where to eat and what to do off the beaten path while other dads were fast asleep on benches as their children swung from the death-defying equipment. Seeing Paris through my children’s eyes was incredible. With a view into this new lens, I fell in love with the city on this trip. As someone who visited Paris frequently as a child, spent a semester in Paris, and had a mother who worked her career for Air France, I am no stranger to Paris. However, Paris is the one city where I sometimes have felt that I fall short of that je ne sais quoi. I planned my wardrobe carefully, but even if I could have passed as a local, there was little chance of my kids going unnoticed. While my daughter ran around in her neon pink sneakers and lime green Gymboree shirt, her French peers would pass on the sidewalk in their pressed, understated navy dresses and black Mary Janes—modern replicas from Madeline. No matter what effort I made, I knew I couldn’t shake our American tourist identity. None of this should have really mattered. And in other countries it would not have. But France is the one country where I sense that infamous superiority complex of the French, and I find myself occasionally feeling self-conscious about our American-ness. My children had their own opportunity to experience this French complex in a more overt gesture. It’s common knowledge that the French don’t believe in queuing and have mastered the art of cutting in line. When an elegant, elderly woman stealthily cut right in front of us in the supermarché, my son’s mouth fell open, aghast at her playground offense. I chuckled to myself. My son had his first lesson on the unspoken French caste system and our lowly rung on the ladder as American tourists. Best time to see the Mona Lisa? Late Friday night. I left Paris feeling that my first attempt at cultural submersion with my kids had been a success. For those short few days and at their young age, we had acclimated to the best possible extent of Parisian daily life. And France was just a baby step in what I hope lies ahead for our immersion experiences. I am already thinking ahead to the Moroccan riad and Japanese machiya that we will rent as the kids get older. I reflected on all of this as I found myself on the Batobus heading for the Eiffel Tower. Search for vacation rentals in Paris. I do believe we took the exact same approach to visiting Paris, from the apartment rental (mine was near the Eiffel Tower), to eating French and living the French lifestyle. My boys — amazingingly — even dressed in shirts with collars and wore comfortable loafers instead of neon American athletic shoes. They LOVED it! The lady who rented us our apartment did not speak English, but lived in the building next door. When we arrived, she greeted us at the Metro with kisses to each cheek and had a French breakfast prepared at our apartment. Every morning she emailed me the events of the day throughout the city, suggested some places to eat and asked if we had any needs or concerns ~ all in French. I would copy and paste into my translate app and have a complete list of markets and activities. I’m not sure how I lucked out with the friendliest woman in all of France, but I did. We still keep in touch! I smiled at your mention of a staircase and apartment living in Paris. We only spent a couple of days once in Paris, but yes, the apartment was up a narrow staircase, though surprisingly there was also a tiny elevator available. That’s why I love renting apartments and trying to live like locals. And letting the kids play at playgrounds, even if they can’t speak the language, they always somehow end up making friends. Thanks for sharing your experience! This was such a well-written post! I really enjoyed reading about your Parisian adventure and took some solace in the fact that it’s not just my children who look permanently scruffy compared to their more well-dressed contemporaries abroad (we live in Mexico City where the children are always impeccably turned out!). Usually when we travel we move about from place to place but your story has inspired me to spend more time in one location and to really immerse ourselves in another city. Thank you! One of our daughter’s favorite destinations in Europe is Paris. She loved all the food, the sights and sounds and of course, the playground. To immerse ourselves in the culture, we all tried to learn basic French before visiting. We didn’t take stay in an apartment in Paris but I do think we will try that next time. What a fantastic read! You have inspired me to add Paris to our list a little earlier than I had originally planned! What a beautiful post! Thank you so much for sharing. We are planning a big trip to Paris with our daughter next year so I’ve bookmarked this page for reference. It’s so key to find playgrounds and parks! We spent quite a lot of time in the playgrounds. Except for the park near our apartment, which was very local, I felt there was always a mix of local kids and tourists and I couldn’t especially tell the locals from the tourist kids until they spoke. I felt the playground near our apartment was very much like my Brooklyn playgrounds with a mix of chattering nannies and parents sitting on benches sneaking in a few extra emails. I did note that in the Jardin Luxembourg the local parents would send their kids in to the playground and sit on a bench outside to avoid the extra admission. But we’re used to urban playgrounds and my daughter is older now, so I also tend to sit on the sidelines with a book rather than shadow her. On the other hand, I felt that in the restaurants and on the Metro it was VERY easy to tell the the French kids from us tourists; they were the ones sitting politely and eating everything and not asking for plain macaroni!